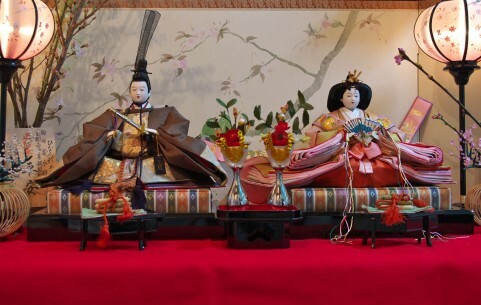 Hina matsuri or the Doll Festival on March 3rd is a special day for girls. Families with young daughters celebrate this day and wish for their happiness and healthy growth. They display a set of dolls on a stepped stand covered with a red cloth. The dolls are dressed in beautiful kimono. Dolls of the Emperor and Empress sit on the top. On other steps there are dolls of their servants, five musicians and miniture funiture. Also, there are offerings such as peach blossoms, hishimochi rice cake and hina arare snacks. These dolls are often passed on from generation to generation. the girls will remain single for a long time. Ancient people transferred their sins and misfortune to the dolls and threw them in rivers.